In 1940, Melvin B. Hoffman (1903-1988), better known as “Pete,” and his wife Helen Kallenberg Hoffman (1907-2003) hired well-known local architect Sherwood Holt to design a house for them on the property they had recently purchased at what would become known as 304 Comstock Road. Originally the Hoffmans planned to build a house on Highgate Road, but when lots became available for sale on Comstock Road, they immediately changed their plans and chose a lot with an elevation that would not only provide good drainage but would be aesthetically pleasing and show off a house to its best advantage. Sherwood Holt produced house plans that suited the family perfectly and had many subtle features that added grace to the structure. For example, the living room ceiling is higher than the other rooms, giving it a feeling of more space than the floor plan indicates. Helen, an elementary school teacher who had a MS from Cornell’s Home Economics Department, worked with Holt to design a kitchen that was efficient and a delight for a cook to work in. Upstairs there were three bedrooms. The original master bedroom had two closets. The larger bedroom over the garage was originally intended to be a mother-in-law bedroom and had its own bathroom. The third bedroom was first used by their son; later he moved to the bedroom over the garage, and it became their daughter’s room. Downstairs the room next to the kitchen often served as a spare bedroom. Whenever one of the children was sick, he or she spent the day in that bedroom where Helen could keep an eye on them. The Cayuga Heights Land Corporation advertised the new Klinewoods Subdivision to Cornell alumni in the June 14, 1935 edition of the Cornell Daily Sun. The Hoffmans felt that they were lucky to have built their house in 1940 before the beginning of World War II. They were able to obtain and use the best construction materials which a short time later became unavailable due to wartime restrictions. 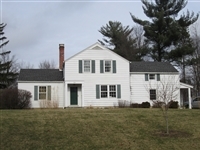 The original siding on the house featured wooden clapboards of a specific width that was most attractive to the overall appearance of the house. Being a wood sided house, of course, it had to be painted periodically. As the Hoffmans grew older, they were persuaded to cover the beautiful wooden siding with aluminum siding with a wider width. Helen always regretted that decision, as she felt the beauty of the house was diminished. 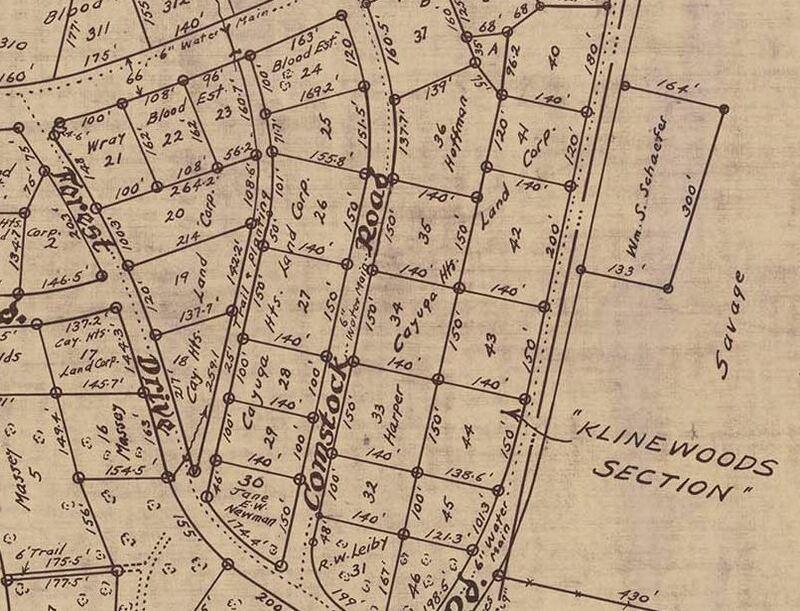 A 1941 map of Cayuga Heights drawn by Village Engineer Carl Crandall shows the the Hoffman's Lot 36 in the Klinewoods Section. Pete Hoffman was a professor of pomology in Cornell’s College of Agriculture. He lovingly chose and planted all the vegetation in the large yard surrounding the house. The bushes and trees were mere seedlings when he put them in the ground, and he vigorously pruned them each year as they grew to keep them from becoming too big. He had a large vegetable garden in the back of the house, where they grew all the vegetables the family ate for the entire year. Helen canned or froze produce all summer and into the fall. Every December Pete pruned the yew bush by the front door into a conical shape and put Christmas lights on it. For Christmas Day he brought a large apple tree log from a former tree at the pomology farm, and the Yuletide log burned all day in the living room fireplace. Sherwood Holt was hired by the Darling family on Midway, a few blocks away, to design a similar house. He asked permission to use the Hoffman plans, and they agreed. He reversed the plans and enlarged them somewhat, but if you look at the two houses, you can still recognize the same basic structure. The home built for the Darling family at 111 Midway Road mirrors the Hoffman's.